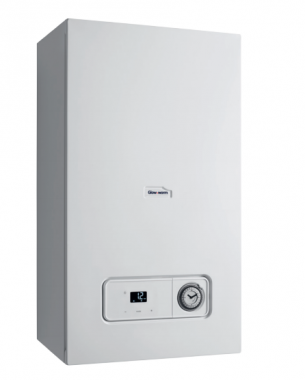 DISCONTINUED.Glow-worm’s Easicom 28c is a condensing and wall mounted Combi gas boiler. This boiler includes a variety of features and benefits which make it a highly reliable, compact boiler. As a Combi boiler it is a water heater and a central heating boiler wrapped into one unit. This means that no hot water cylinder is required, so it can help you to save that much needed space in your home. The smart design and quiet operation of this boiler will really suit the more modern home. It has an efficiency rating of 89.3% making it an B rated boiler which should enable you to save you money on your energy bills. This model has an output rating of 28kW making it the perfect solution for a medium sized property that does not have a high hot water or heating demand. This boiler comes with a high quality automotive grade aluminium heat exchanger helping to provide excellent performance, a standard horizontal flue and a pre-fitted analogue clock. You also have the option to have the boiler installed with Glow-worm’s advanced controls including mobile phone app based controls. This boiler includes a bright LCD display with an easy to use interface give you maximum control over the unit. It is also available as a 24kW output for a slightly smaller home. It features a 4 year warranty to give you peace of mind you have got a highly reliable boiler.